Editor: To this day wherever I travel I remember the advice Jerri Fosdick gave us in our first introductory session in Philadelphia ” Do not underestimate how much emotional energy and space it takes to move to a different country – even small things you have taken for granted all your life, like the way light switches work, are different and until you get accustomed to it, each time you switch the light on your focus will be momentarily diverted.” So reassuring as I battled to get settled in this supposedly familiar but actually very different country. Of course this applied in spades to bigger issues such as the work culture, travelling on public transport and setting up home. Jerri, how did you become involved in the Harkness Fellowships programme? Jerri Fosdick: William Plowden found me. I had been working with the Minnesota Attorney General’s office and William met one of the directors from there. They talked about what William was thinking about with regard to updating the fellowship scheme. He invited me to come to New York for a meeting and soon we were deep in conversation about how to design the new Harkness Fellowship scheme to achieve the goals the Commonwealth Fund was hoping for. Ed: What role did you play? JF: I was involved in two ways. First, in the early design of the programme in 1988/89, and in the early 90’s I came to the group sessions. JF: The Commonwealth Fund wanted to give Harkness Fellows the tools to go back home and inspire changes in their professions. So we looked at a number of ways to build and sustain that capacity. For example, it had already been decided that mid-career professionals would be invited to apply. These people would have a good understanding of the spheres they were working in, and a realistic sense of the challenges to achieve change in their fields. However, mid-career professionals often have families. William and I discussed whether families should be included in the new scheme. The decision was made to cover the cost of families coming too, knowing that it would probably lead to a reduction in the numbers of fellows. The Fellowship is a life changing opportunity and if a mid-career professional was to experience it alone, it would be too disruptive to their family. Whole family involvement sustains the memories and impact of the fellowship year and supports the returning fellow to make use of his/her US experience. Having families experience the US was a way to reinforce Edward Harkness’ original goal of wanting fellows to love the US and improve international understanding. Ed: I was a Fellow during this era and I notice when talking to other Fellows that there was less group activity in previous years. JF: Yes, again that was an explicit design feature. We wanted Harkness Fellows to get a lot of support from each other, to develop a working community – both to enhance their learning in the US and to provide support when they got back home. N=1 has always been a difficult and lonely way to introduce change. Ed: Well we know that worked – one group from that era still gathers every year, and many lifelong friendships were made. And your contributions to the group sessions? JF: There were two key themes for my contributions. One was to build the working community, so there were always structured interactions to create sustainable working relationships. Spouses were often involved, adding different perspectives to the discussions and enhancing the joint family experience. The other key theme was to prepare the fellows and their families for the changes they would be going through and to help them handle the cultural transitions and upheavals- professional, personal and family. We knew that fellows would arrive buoyed up with excitement about the year ahead, and would often not expect that there would be significant difficult times. Mid-career professionals are usually working within their comfort zones, and feeling incompetent – as they no doubt would during the early months – can be very unnerving. And, if the family is struggling, there is an added burden on the HF for having brought them to the US. There was also input about going home; how to sustain the memories and learning, and also how to handle the reactions of those who might be resentful or act as if they’d never been away. Ed: I found everything you said about going home so pertinent – how come you understood this so well. JF: My contributions were underpinned by organisation development theory and studying intercultural transitions but my own experience of living in London for almost two years with my young daughter and returning to the US gave me real insight into these issues. 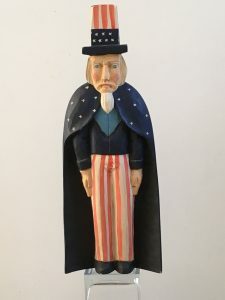 Ed: I recall we were given an Uncle Sam memento to take home, and put somewhere visible to trigger memories – I still have mine in a prominent place in the living room. JF: We wanted you to continue to think about your Harkness Fellowship experience in the US, what you learned and what ideas you could introduce back home. A memento acts as a trigger. We also encouraged families to bring special things from home when they came to the US in order to stay connected to their home country and life and to keep family and colleagues back home included in their US experiences to the degree possible. It helps in bridging the discussion gaps when returning home. Ed: I have always wondered, what did the Americans get from our time as fellows. I know the scheme was set up to build international understanding but do the home countries get far more from this than the host country. JF: All I can say is that I never heard of any difficulty in finding institutions that were willing to host Harkness Fellows. I think they really enjoyed having that different experience in staff meetings and research discussions, and of course Harkness Fellows always seemed willing to contribute. The Fellows are people who self-selected into this experience, partly because of their sense of adventure and desire to learn, and that’s appreciated everywhere. Ed: Thank you very much for sharing all this with us. JF: You’re very welcome – it was one of my favourite projects and I still enjoy hearing about Harkness Fellows. Jerri is the founder of Bridges to Learning, Inc. and you can reach her at Jerilyn@bridges2learning.org.